There’s so much more to eating healthier in the New Year than ditching carbs and including more water, fruit and vegetables in your diet (though all this is undeniably helpful). Here are our 19 favourite tips for eating healthier, giving your body the nutrition it needs, and getting and staying on the path to better health and well being. 1.Choose protein for breakfast – Begin your day right with a protein rich breakfast that will keep you satiated for longer. 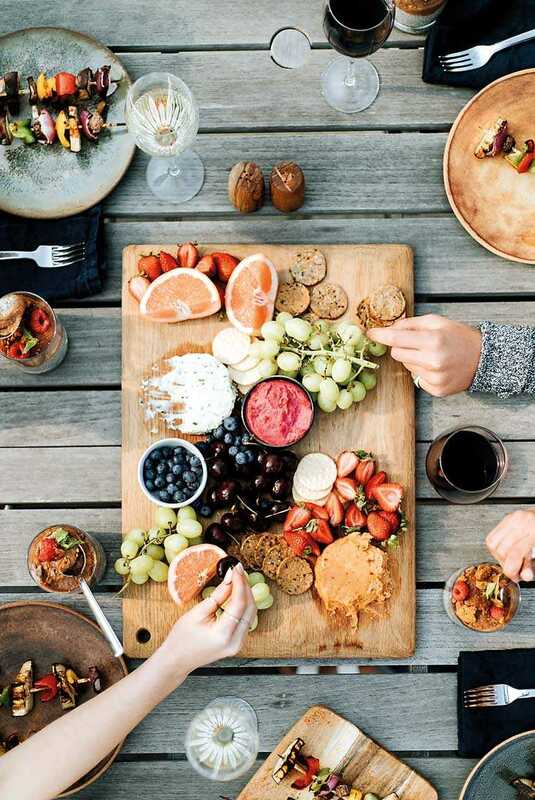 2.Food is neither a comfort nor a reward – While of course going out for a celebratory meal isn’t taboo, it’s important to stop using food as a reward in the good times or a source of solace in the bad. 4.Eat mindfully – Give your meal the time and attention that it (and you) deserves. Take 30 minutes to eat your lunch or dinner and don’t watch TV, read, visit FB or play games on your phone. 5.Eat probiotic-rich food – Greek yoghurt, kombucha and miso soup all contain probiotics that provide our digestive systems with the good bacteria they need. Eat or drink one of these everyday for best results. 6.Tea at night – Relax, hydrate and de-stress at the end of the day with a cup of herbal tea. Unhealthy night time snacking often occurs due to stress and difficulty falling asleep, and a soothing cup of tea will prevent that. 7.Indulge your cravings – But do so in a mindful manner. Compete deprivation is never helpful, and indulging in a daily treat may actually be a winning formula, as long as you learn to manage the experience properly by focusing on it, and enjoying it to the full. 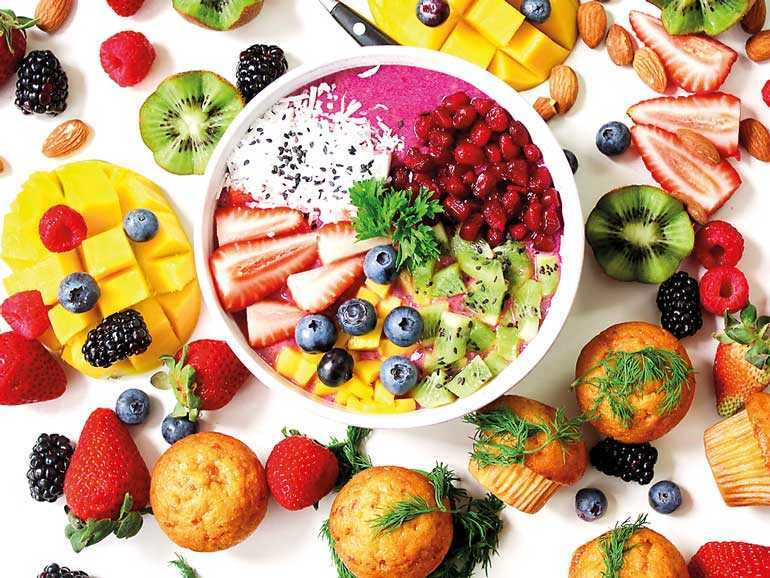 8.Eat double rainbows – Aim to consume two servings of foods naturally colored red, orange, yellow, green, blue/purple, and white, every day. 9.Take your pulse – Include more pulses like dried peas, beans, chickpeas, and lentils in your diet. They deliver a healthy dose of plant-based protein, filling fiber, and nutrients like iron and folate. 10.Three days sugar free – Challenge yourself to go 72 hours without any sugar that isn’t naturally occurring (this means that fruit is fine). Read labels carefully and watch for hidden sugars in protein bars, protein shakes, and gluten-free snacks. 11.Ditch meat for a day – On just one day a week, stick to a meat free diet. This helps with weight loss and can also be protective against types of cancer, diabetes, and heart disease. 12.Red, orange and green – If the rainbow diet seems unrealistic, then pick the simpler red, green, and orange rule. Include one red, green and orange vegetable or fruit with every meal. These provide an excellent source of disease-fighting nutrients. 13.Breathe better – Take a full, deep breath between each bite. Doing this helps to slow you down a bit and relax some of that tension that may be sitting in your abdomen. 14.Stop eating at 7:30 p.m. – A great way to avoid those unhealthy late night snacks, and ensure that you wake up every morning feeling refreshed and invigorated. 15.Lemon mornings – Start your morning with a glass of lemon water. Lemons are a diuretic and help diminish bloat. 16.The reason for the season – Toss out your salt and replace it with spices and lemon. It’s a great way to reduce your risk of developing high blood pressure and heart disease. 17.Ban the boxes – Don’t eat anything that comes out of a box. Shelf-stable foods are often high in the types of ingredients we actually want to avoid. Not to mention the negative impact all that packaging has on the environment. 18.Use smaller plates – Switch to your salad plates instead of dinner plates and ramekins instead of dessert bowls. 19.The 10 minute toss – Every week, take 10 minutes of your time and go through your fridge and pantry cupboards. Get rid of all the expired food or junk food you find. The rule is simple – if you don’t have it in the house, you can’t put it in your tummy!